Because of their special educational needs, all students attending Oak Lodge have attainment levels that are generally below expected standards for their age. This means that Progress 8 or Attainment 8 scores are not recorded. This is also the case for the percentage of pupils getting a good pass in English and maths GCSE or achieving the English Baccalaureate. Click on the relevant year to view tables of qualifications previously gained by students during the time that we were a maintained school in 2015 and 2016. Results for 2017 are available here. Click here for DfE School and College Performance data. 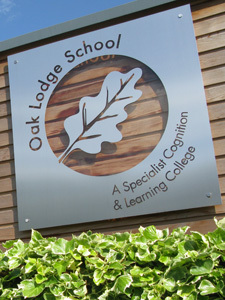 All students who completed Year 11 at Oak Lodge in 2017 moved onto further programmes of learning; either in the school's Post-16 department or at local FE colleges. The following qualifications are currently offered in the Upper School, subject to individual ability of candidates, who will be entered for a qualification based on their assessed attainment and expected progress. ASDAN's established Personal Development Programmes (Bronze, Silver and Gold) offer imaginative ways of developing, recording and certificating a wide range of young people’s personal qualities, abilities and achievements, as well as introducing them to new activities and challenges. All the programmes link to nationally recognised qualifications including the qualifications below. The Award of Personal Effectiveness (AoPE) is a nationally recognised qualification, available at Levels 1, 2 and 3. It can accredit many of the imaginative and diverse activities undertaken by learners, both inside and outside of school. Assessment is based on a portfolio of evidence. The AoPE assessment units encourage the development of the skills required for progression to further education, training or employment. AoPE is a shorter version of the Certificate of Personal Effectiveness, that sits within the Regulated Qualifications Framework (RQF) and is approved as eligible for use in Foundation Learning provision at Level 1. The Entry 1 qualifications in Personal Progress are approved qualifications, eligible for use in Foundation Learning provision. They are made up of units which can be broadly divided into the following areas: Literacy/Numeracy/IT; Independent Living Skills; Personal Development; Community Participation; Preparation for Work; Units Particularly Accessible for Learners with PMLD.